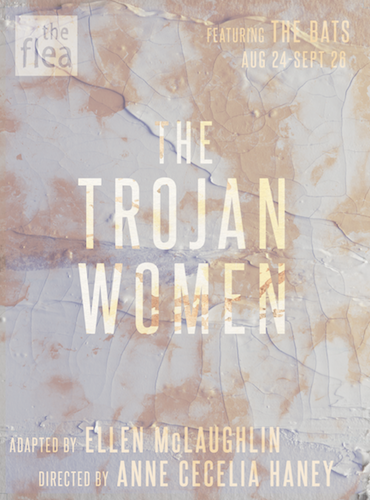 The New York Premiere of Ellen McLaughlin’s adaptation of THE TROJAN WOMEN- Extended Through September 30th! The women of Troy have been sold into slavery. Their husbands are dead, their city destroyed, and it seems as though the gods have forgotten them. As they wait to be taken away, the women grapple with grief, fear and the gravity of total loss. Known as the first anti-war play in the western canon, Euripides’ The Trojan Women presents an enduring message about the consequences of war. is an award-winning playwright and actor. Her plays include Tongue of a Bird, A Narrow Bed, Iphigenia and Other Daughters, Trojan Women, Infinity’s House, Helen, The Persians, Oedipus, Ajax in Iraq, Kissing the Floor, Septimus and Clarissa, Pericles and Penelope. Her work has been performed Off-Broadway in New York, as well as regionally and overseas. Producers include The Public Theater, National Actors Theatre, Classic Stage Co., New York Theatre Workshop, The Guthrie, The Intiman, The Mark Taper Forum, Oregon Shakespeare Festival, Actors Theatre of Louisville, and The Almeida Theatre in London. Among her honors are the Susan Blackburn Prize and the Lila Wallace—Reader’s Digest Writer’s Award. She has taught playwriting at Barnard College since 1995. Other teaching posts include Princeton University and Yale School of Drama. As an actor, she is most well known for having originated the part of the Angel in Tony Kushner’s Angels in America, appearing in all workshops and productions of the play through its Broadway run in 1993-94. Anne Cecelia Haney is a Brooklyn-based director, translator, and musician. Blending a text-based approach with a surrealist aesthetic, she develops new work that draws on classical influences and responds to contemporary political and social happenings. She is drawn to performance that explores human perception of time and reality, society’s engagement with rural communities, and the power and wildness of the female body. Anne has developed and premiered work with The Bushwick Starr, Dixon Place, Rising Circle Theater Collective, Cloud City/The Freight Project, The Brick Theater, IRT, The Samuel French Off-Off Broadway Short Play Festival, Emerging Artists Theater, Columbia University, and the NYU Department of Dramatic Writing, as well as at Highways Performance Space in Los Angeles and on a patio in Rio de Janeiro, Brazil. She has assisted productions for BAM’s Next Wave Festival, the Prototype Festival, and Atlantic Theater Company.